"We live in a sphere of contrasts. Soft beats. Hard scapes. Hard words to soft structures, soft whispers to ravaging whipping. Cotton Ferox is the wonderful cloud in the blue sky when you're lying down on the grass, your head spinning on LSD." What's the point in trying to describe something that's described so well in the first song, 'The Cotton Ferox manifesto', a spoken word outline of everything Cotton Ferox is about. Then again, after the ambient sounds of that track, 'Red light glow' with the jazzy sax sounds, like something out of a Tom Waits movie soundtrack, again featuring Carl Abrahamsson's Nordic accented voice, do, as they say themselves, cause "a micro-upheaval of your expectations". 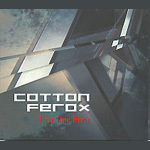 The sound of Cotton Ferox has much in common with the likes of Recoil and Barry Adamson than the average band from the dark ambient/atmospheric sphere, difficult to stick into a specific box, transcending boundaries by creating dark and moody, yet also melodic and appealing sounds. Through the album, they feature a number of voices other than Carl's. Michael Moynihan contributes a reading from Ernst Jünger's "Blut", a pessimistic (some might say realistic) view of humanity's violent tendencies, on 'Sanguine essence'. There's also a couple of tracks, 'Snake hiss' and 'Anenema', from the legendary Genesis P Orridge, of Throbbing Gristle & Psychic TV, his unmistakable speaking voice somehow creating an atmosphere both soothing and sinister. Genesis will feature exclusively on their forthcoming second album, "Wordship", a follow-up to the album "At Stockholm" the Cotton Ferox members, as White Stains, recorded with him. It all wraps up with 'Phantasmoplasm', featuring the amazing singing of Krister Linder over an atmospheric electronic soundscape. It's a strong finish, showing, if there was any doubt, the ability of Cotton Ferox to create appealing and accessible music. This is an album that deserves to reach a larger audience than the average atmospheric release. Their sophisticated and well-constructed sound is likely to appeal to many that would expect it to.